Although they remain one of the most sought-after pieces of technology in many school districts, interactive whiteboards have a fair number of critics who point to their expense and lack of portability. Students and teachers want access to computer devices 24-7 -- whether they're at school or at home. That means there's a demand for more mobile technology, not immobile whiteboards. At the same time as many educators are rethinking the hardware involved with instruction, some are rethinking other ways in technology can change the classroom. Some are experimenting with the "flipped classroom" -- the idea, made quite famous lately thanks to Khan Academy, that videotaped instruction can be assigned as homework, while in-class time can be used for more personalized remediation, for collaboration among teachers and students, and for the types of exercises that have typically been seen as homework. 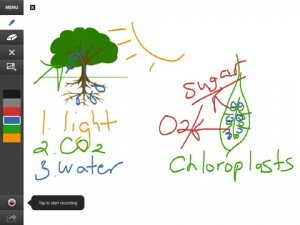 A new app taps into both of these phenomena: bringing an interactive whiteboard-like experience to the iPad and to the Web and making it easy for iPad owners to create their own instructional videos. ShowMe is a free app that lets users record a tutorial with a voice-over that can then be shared as a video online or embedded into other websites. With the app, you can write directly onto the screen as you record your voice. You can also import various images to help illustrate your lesson. The app is easy to use, thanks in no small part to the beta process that included teachers' and students' input. One of those things was to simply make the process of creating videos to use in a "flipped classroom" easier. In this case, there is minimal equipment needed -- just an iPad. But the app also makes it possible to democratize that process too. It isn't simply one teacher's videotaped efforts here -- ShowMe allows teachers and students like to build and share videos. And ShowMe founder San Kim says that he hopes to be able to build a Vimeo-like community around the video content, where users can comment, review and discover quality instructional content. Kim told me he wants to enable anyone to build their own portfolio of educational content - to build hundreds of Khan Academies. That's a goal that puts teacher- and student-generated content at the center of education, one enabled by a simple, but smoothly functioning app -- all on a portable device.